The Lobby Lounge at Novotel Ambassador Gangnam presents its special afternoon attraction, crepe, a French style pancake made with white wheat flour, milk and egg. This French classic delicacy has been spread out to all over the world and especially in Japan, it became quickly popular among the travelers. Crepe, in Korea, is one of the popular substitutes for breakfast for business people and a quick meal choice at major hotels in town. The new crepe menu at the lobby lounge includes crepe for around 9,000 won and crepe with various choices of tea at around 14,000 won. 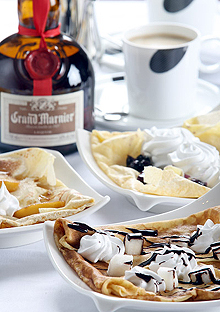 All crepes are served with dressings such as chocolate, honey almond, blueberry and orange.